We made a survey of water-vapor maser emission for 93 AGNs with theNobeyama 45-m and Mopra 22-m telescopes from 1999 to 2002. 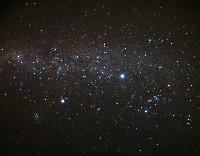 A megamaserwas detected in a Seyfert 2 galaxy, NGC 6926, at a distance of 80Mpc, in2002 June. [Greenhill et al. (2003a) have also reported a detection ofthe megamaser at the close date.] The peak flux density was 110mJy, andthe total isotropic luminosity was 340 Lȯ. The masershows triply peaked spectrum, suggesting an edge-on disk. A narrow-linefeature of the maser components at VLSR = 6001 kms-1 was strongly variable with a time scale of a few tens ofdays, and the variation should be of intrinsic origin. We also showed apossibility of variability of water-vapor maser emission of a megamaserpreviously detected in a Seyfert/ultraluminous FIR galaxy, NGC 6240. An extended HI cloud (VIRGOHI21) with an HI mass of~108Msolar and no apparent optical counterpart wasrecently discovered in the Virgo cluster. In order to understand theorigin of physical properties of apparently isolated HI clouds likeVIRGOHI21, we numerically investigate physical properties of tidal HIdebris that were formed by galaxy-galaxy interactions in clusters ofgalaxies. Our hydrodynamical simulations demonstrate that tidal debriswith total HI masses of 108-109Msolarcan have (1) a wide spread of HI velocities (>200kms-1),(2) a small mass fraction of stars (~10 per cent), and (3) a mean B-bandsurface brightness of the stellar components fainter than 30magarcsec-2. These results suggest that VIRGOHI21, which liesat a projected distance of ~150 kpc from the one-armed, HI-rich spiralgalaxy M99 (NGC 4254), is tidal debris. We propose that the comparisonbetween the simulated and the observed velocity fields of HI cloudsallows us to better understand their nature and origin (e.g. whetherthey are just tidal debris or are `dark galaxies' that have HI gas onlyand are embedded within dark matter haloes). The HI Parkes All-Sky Survey (HIPASS) gives an unprecedented view of thelocal large-scale structures in the southern sky. I will review theresults from the HIPASS Bright Galaxy Catalogue (BGC, Koribalski et al.2004) and the first version of the deep catalogue (HICAT, Meyer et al.2004) with particular emphasis on galaxy structures across the Zone ofAvoidance. Some previously hardly noticed galaxy groups stand out quitedistinctively in the HI sky distribution and several large-scalestructures are seen for the first time. Because HI surveyspreferentially detect late-type spiral and dwarf galaxies, theirdistribution is less clustered than that of optically selected galaxies.HI surveys also significantly enhance the connectivity of large-scalefilaments by filling in gaps populated by gas-rich galaxies. We present λ3.5 cm and λ6.2 cm radio continuum maps intotal and polarized intensity of the barred galaxies NGC 1097 (at2´´-15´´ resolution) and NGC 1365 (at9´´-25´´ resolution). A previously unknown radiogalaxy southwest of NGC 1097 is reported. Apart from a smooth faintenvelope and a bright central region, both galaxies exhibit radio ridgesroughly overlapping with the massive dust lanes in the bar region. Thecontrast in total intensity across the radio ridges is compatible withcompression and shear of an isotropic random magnetic field, where thegas density compression ratio is approximately equal to 4 and the cosmicray density is constant across the ridges. The contrast in polarizedintensity is significantly smaller than that expected from compressionand shearing of the regular magnetic field; this could be the result ofdecoupling of the regular field from the dense molecular clouds. Theregular field in the ridge is probably strong enough to reducesignificantly shear in the diffuse gas (to which it is coupled) andhence to reduce magnetic field amplification by shearing. Thiscontributes to the misalignment of the observed field orientation withrespect to the velocity vectors of the dense gas. Our observations, forthe first time, indicate that magnetic forces can control the flow ofthe diffuse interstellar gas at kiloparsec scales. The total radiointensity reaches its maximum in the circumnuclear starburst regions,where the equipartition field strength is about 60 μG, amongst thestrongest fields detected in spiral galaxies so far. The regular fieldin the inner region has a spiral shape with large pitch angle,indicating the action of a dynamo. Magnetic stress leads to mass inflowtowards the centre, sufficient to feed the active nucleus in NGC 1097. 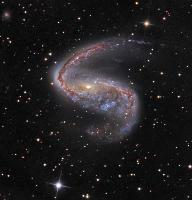 -We detected diffuse X-ray emission, possibly forming a halo of hot gasaround NGC 1097. Cosmic magnetism has that exotic ``Je ne sais quoi''! Magnetism has beenobserved in various objects, located near the edge of the Universe andall the way down to the Milky Way's center. The observed magnetic fieldcan take the cell-type shape in randomly-oriented large blobs found inintracluster gas or outside of clusters of galaxies, the helix shape insynchrotron jets, the longitudinal shape in ram-pressured shocks inradio lobes near elliptical galaxies, the spiral shape of logarithmicarms in spiral galaxies, or the egg shape of an enlarged interstellarbubble. In strength, the magnetic field varies from 0.1 nG(cosmological), to 20 μG (galaxies, jets, superbubbles), and to 1 mGin the Milky Way filaments.Magnetism plays a small physical role in the formation of largestructures. It acts as a tracer of the dynamical histories ofcosmological and intracluster events, it guides the motion of theinterstellar ionised gas, and it aligns the charged dust particles.Batteries and dynamos are often employed in models to create and amplifyseed magnetic fields. Starting soon after the Big Bang (redshiftz>2000), this review covers the cosmological background surface(z~1100, distance ~4.3 Gpc), the epoch of first stars (z~20 distance~4.1 Gpc), the currently observable Universe (z~10, distance ~3.9 Gpc),superclusters of galaxies (size ~50 Mpc), intracluster gas (size ~10Mpc), galaxies (~30 kpc), spiral arms (~10 kpc), interstellarsuperbubbles (~100 pc), synchrotron filaments (~10 pc), and the MilkyWay's center. 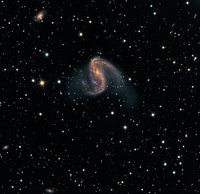 We have mapped the neutral gas content of the surroundings of threegalaxies on the outskirts of the Local Group - Wolf-Lundmark-Melotte(WLM), NGC 1313 and Sextans A - at high velocity resolution andbrightness sensitivity. We present high-quality HI spectra andparameters for the target galaxies, and find no unknown companion HIclouds nearer than ~100 kpc to the targets, despite reaching asensitivity of ~106 Msolar for narrow-linewidthobjects. 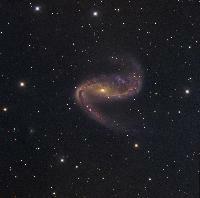 The λ6 cm radio continuum emission from the barred galaxy NGC2442 displays several unusual features that are probably due to theinteraction of the galaxy with the intergalactic medium. HIPASS J0731-69: Tidal Debris, or Primordial Gas Cloud? We present follow-up high-resolution H I, deep optical, and molecularobservations of the intergalactic gas cloud HIPASS J0731-69, andre-examine the question of its origin in light of these new data. There is plenty of intergalactic H I gas without any obvious stellarcontent ranging from (1) extended gas envelopes around some normal andpeculiar galaxies, (2) tidal tails/bridges in interacting or merginggalaxy systems, (3) large-scale rings around early type galaxies, and(4) detached clouds at varying distances from associated galaxies, butthere are few or no isolated H I clouds.The HIPASS Bright Galaxy Catalog, which covers the whole southern sky,contains only one definite extragalactic H I cloud which is locatedclose to the galaxy NGC 2442 whereas it is sensitive to isolated H Iclouds with MHI > 106 × D2Mȯ. The space density of H I clouds is therefore about1/1000th that of galaxies with the same MHI. Observations of the southern peculiar galaxy NGC 2442with the Australia Telescope Compact Array in total and linearlypolarized radio continuum at λ6 cm are presented and comparedwith previously obtained Hα data. The distribution of polarizedemission, a signature of regular magnetic fields, reveals some physicalphenomena which are unusual among spiral galaxies. We find evidence fortidal interaction and/or ram pressure from the intergalactic mediumcompressing the magnetic field at the northern and western edges of thegalaxy. The radial component of the regular magnetic field in thenorthern arm is directed away from the centre of the galaxy, a findingwhich is in contrast to the majority of galaxies studied to date. Theoval distortion caused by the interaction generates a sudden jump of themagnetic field pattern upstream of the inner northern spiral arm,similar to galaxies with long bars. An unusual ``island'' of strongregular magnetic field east of the galaxy is probably the brightest partof a magnetic arm similar to those seen in some normal spiral galaxies,which appear to be phase-shifted images of the preceding optical arm.The strong magnetic field of the ``island'' may indicate a past phase ofactive star formation when the preceding optical arm was exposed to rampressure. Details are presented of the HI Jodrell All Sky Survey (HIJASS). HIJASSis a blind neutral hydrogen (HI) survey of the northern sky (δ> 22°), being conducted using the multibeam receiver on theLovell Telescope (full width at half-maximum beamwidth 12 arcmin) atJodrell Bank. HIJASS covers the velocity range -3500 to 10 000 kms-1, with a velocity resolution of 18.1 km s-1 andspatial positional accuracy of ~2.5 arcmin. Thus far about 1115deg2 of sky have been surveyed. The average rms noise duringthe early part of the survey was around 16 mJy beam-1.Following the first phase of the Lovell Telescope upgrade (in 2001), therms noise is now around 13 mJy beam-1. We describe themethods of detecting galaxies within the HIJASS data and of measuringtheir HI parameters. The properties of the resulting HI-selected sampleof galaxies are described. 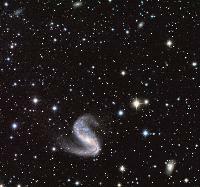 Of the 222 sources so far confirmed, 170 (77per cent) are clearly associated with a previously catalogued galaxy. Afurther 23 sources (10 per cent) lie close (within 6 arcmin) to apreviously catalogued galaxy for which no previous redshift exists. 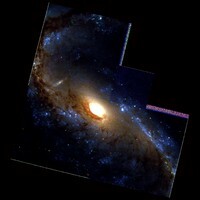 Afurther 29 sources (13 per cent) do not appear to be associated with anypreviously catalogued galaxy. The distributions of peak flux, integratedflux, HI mass and cz are discussed. We show, using the HIJASS data, thatHI self-absorption is a significant, but often overlooked, effect ingalaxies with large inclination angles to the line of sight. Properlyaccounting for it could increase the derived HI mass density of thelocal Universe by at least 25 per cent. The effect that this will haveon the shape of the HI mass function will depend on how self-absorptionaffects galaxies of different morphological types and HI masses. We alsoshow that galaxies with small inclinations to the line of sight may alsobe excluded from HI-selected samples, since many such galaxies will haveobserved velocity widths that are too narrow for them to bedistinguished from narrow-band radio-frequency interference. This effectwill become progressively more serious for galaxies with smallerintrinsic velocity widths. If, as we might expect, galaxies with smallerintrinsic velocity widths have smaller HI masses, then compensating forthis effect could significantly steepen the faint-end slope of thederived HI mass function. We present a new, accurate measurement of the H I mass function ofgalaxies from the HIPASS Bright Galaxy Catalog, a sample of 1000galaxies with the highest H I peak flux densities in the southern(δ<0deg) hemisphere. This sample spans nearly 4orders of magnitude in H I mass[log(MHI/Msolar)+2logh75=6.8-10.6] andis the largest sample of H I-selected galaxies to date. We develop abivariate maximum likelihood technique to measure the space density ofgalaxies and show that this is a robust method, insensitive to theeffects of large-scale structure. The resulting H I mass function can befitted satisfactorily with a Schechter function with faint-end slopeα=-1.30. This slope is found to be dependent on morphologicaltype, with late-type galaxies giving steeper slopes. We extensively testvarious effects that potentially bias the determination of the H I massfunction, including peculiar motions of galaxies, large-scale structure,selection bias, and inclination effects, and we quantify these biases.The large sample of galaxies enables an accurate measurement of thecosmological mass density of neutral gas:ΩHI=(3.8+/-0.6)×10-4h-175. Low surface brightness galaxies contributeonly ~15% to this value, consistent with previous findings. We present the largest galaxies as seen in the near-infrared (1-2μm), imaged with the Two Micron All Sky Survey (2MASS), ranging inangular size from 1' to 1.5d. We highlight the 100 largest in thesample. The galaxies span all Hubble morphological types, includingelliptical galaxies, normal and barred spirals, and dwarf and peculiarclasses. The 2MASS Large Galaxy Atlas provides the necessary sensitivityand angular resolution to examine in detail morphologies in thenear-infrared, which may be radically different from those in theoptical. Internal structures such as spirals, bulges, warps, rings,bars, and star formation regions are resolved by 2MASS. In addition tolarge mosaic images, the atlas includes astrometric, photometric, andshape global measurements for each galaxy. A comparison of fundamentalmeasures (e.g., surface brightness, Hubble type) is carried out for thesample and compared with the Third Reference Catalogue. 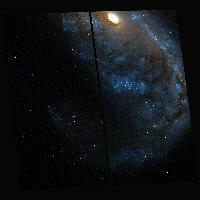 We furthershowcase NGC 253 and M51 (NGC 5194/5195) to demonstrate the quality anddepth of the data. The atlas represents the first uniform, all-sky,dust-penetrated view of galaxies of every type, as seen in thenear-infrared wavelength window that is most sensitive to the dominantmass component of galaxies. The images and catalogs are availablethrough the NASA/IPAC Extragalactic Database and Infrared ScienceArchive and are part of the 2MASS Extended Source Catalog. To quantify the distribution of bar shapes in spiral galaxies, we haveanalysed 113 H-band and 89 B-band galaxy images from the Ohio StateUniversity Bright Spiral Galaxy Survey. Parameters measuring bar shapeand position along the Hubble sequence were obtained in each waveband.Evidence was found for a bimodality in the distribution of bar shape,implying that barred and unbarred galaxies are not just the extrema of asingle distribution, and that any evolution between these two statesmust occur on a rapid time-scale. Objective bar shapes measured in theH-band were found to be more closely related to visual classificationsthan B-band bar strengths, as the B-band images are somewhat compromisedby localized star formation, especially in later type systems. Galaxieswere found to be more centrally concentrated in the infrared. Later typegalaxies showed greater asymmetry in the optical than the infrared,presumably again owing to localized star formation, but on average thebar shapes in the two bands were found to be the same. I present results on the correlation between galaxy mass, luminosity,and metallicity for a sample of spiral and irregular galaxies havingwell-measured abundance profiles, distances, and rotation speeds.Additional data for low surface brightness galaxies from the literatureare also included for comparison. These data are combined to study themetallicity-luminosity and metallicity-rotation speed correlations forspiral and irregular galaxies. The metallicity-luminosity correlationshows its familiar form for these galaxies, a roughly uniform change inthe average present-day O/H abundance of about a factor of 100 over 11mag in B luminosity. However, the O/H-Vrot relation shows achange in slope at a rotation speed of about 125 km s-1. Atfaster Vrot, there appears to be no relation between averagemetallicity and rotation speed. At lower Vrot, themetallicity correlates with rotation speed. This change in behaviorcould be the result of increasing loss of metals from the smallergalaxies in supernova-driven winds. This idea is tested by looking atthe variation in effective yield, derived from observed abundances andgas fractions assuming closed box chemical evolution. The effectiveyields derived for spiral and irregular galaxies increase by a factor of10-20 from Vrot~5 to 300 km s-1, asymptoticallyincreasing to approximately constant yeff forVrot>~150 km s-1. The trend suggests thatgalaxies with Vrot<~100-150 km s-1 may lose alarge fraction of their supernova ejecta, while galaxies above thisvalue tend to retain metals. The H I Parkes All-Sky Survey (HIPASS) is a blind 21 cm survey forextragalactic neutral hydrogen, covering the whole southern sky. TheHIPASS Bright Galaxy Catalog (BGC) is a subset of HIPASS and containsthe 1000 H I-brightest (peak flux density) galaxies. Here we present the138 HIPASS BGC galaxies that had no redshift measured prior to theParkes multibeam H I surveys. Of the 138 galaxies, 87 are newlycataloged. Newly cataloged is defined as having no optical (or infrared)counterpart in the NASA/IPAC Extragalactic Database. Using the DigitizedSky Survey, we identify optical counterparts for almost half of thenewly cataloged galaxies, which are typically of irregular or Magellanicmorphological type. Several H I sources appear to be associated withcompact groups or pairs of galaxies rather than an individual galaxy.The majority (57) of the newly cataloged galaxies lie within 10° ofthe Galactic plane and are missing from optical surveys as a result ofconfusion with stars or dust extinction. This sample also includes newlycataloged galaxies first discovered by Henning et al. in the H I shallowsurvey of the zone of avoidance. The other 30 newly cataloged galaxiesescaped detection because of their low surface brightness or opticalcompactness. Only one of these, HIPASS J0546-68, has no obvious opticalcounterpart, as it is obscured by the Large Magellanic Cloud. We findthat the newly cataloged galaxies with |b|>10° are generally lowerin H I mass and narrower in velocity width compared with the totalHIPASS BGC. In contrast, newly cataloged galaxies behind the Milky Wayare found to be statistically similar to the entire HIPASS BGC. Inaddition to these galaxies, the HIPASS BGC contains four previouslyunknown H I clouds.